Product catalog is a module of Asset management. It is a set of information about an asset. It offers centralised approach and helps you manage the assets and products that you are currently using in your organisation. Products are tightly linked with vendor or supplier management and holds all information related to each vendor. Further, products catalog are made available under Asset addition form where you can attach product to an asset (hardware or software asset). A detailed and well-maintained product catalog can coordinate with service catalog, asset, procurement, request, contract, and vendor information. You can link multiple vendors and track each vendors price at one place. 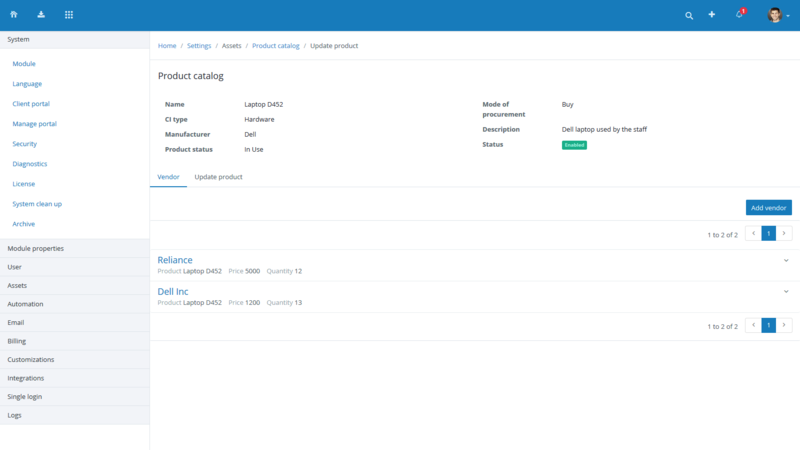 Define product status and easily identify the products that are in production or expired. Setup multi level configuration item types category to make browsing through products easy. Differentiate products across departments thus making it easy to identify the usage. Know the latest value of your products after calculating the depreciation.